A few years ago we were discussing these , and something jogged my mind when I was talking about larger scale buildings to 3D print. corrugated iron, and I thought why not go back to an idea I had thought about. Various suggestions had been made on how to create the corrugations. I had managed to bend corrugated cardboard. There are models in various scales, I have even seen one for 1/76 scale on Shapeways, but not so many models in bigger scales. I thought I would have a quick google search for plans. 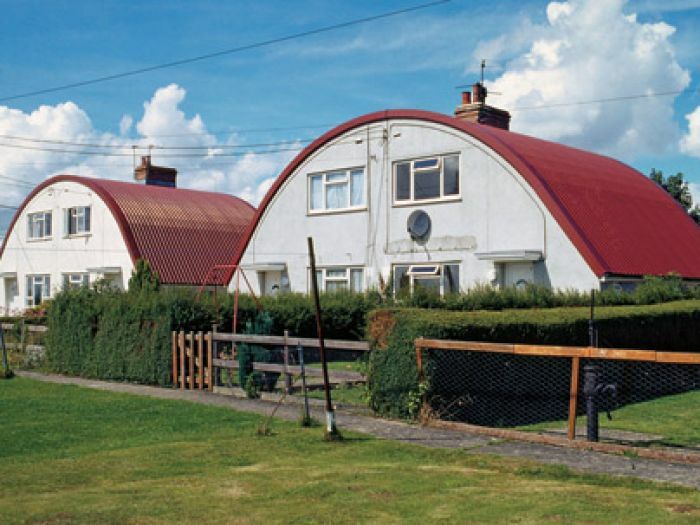 I have the book about Quonset huts, but not enough info , especially for the original Nissen hut. There were a lot of variations. I would want something with potential to see interior. In the past I had asked about corrugated iron sizes, many different, but was sure old stuff was about 3in . I found this to be correct and found a host of other useful measurements online, so I think this is a definite possible. Even the wave shape made sense when I had the measurements. Creating it curved is no problem in CAD program. As with other buildings I will make this modular, and in different scales. In 1/32 they are pretty big, so 1/24 will be big. Might have to make modules smaller. Design wise I will actually start in 1/12th scale to get detail in, then reduce it. Last edited by rue_d_etropal on Mon Jun 20, 2016 8:12 pm, edited 1 time in total. great idea. a modular system would be perfect, this way one can use them as backdrop or a full building, as space allows. I agree 1:24 would be a bit big but the market would be a lot bigger since all the military guys would be interested in it too. especially since the 1;24 SCALE range is very limited in accessories. 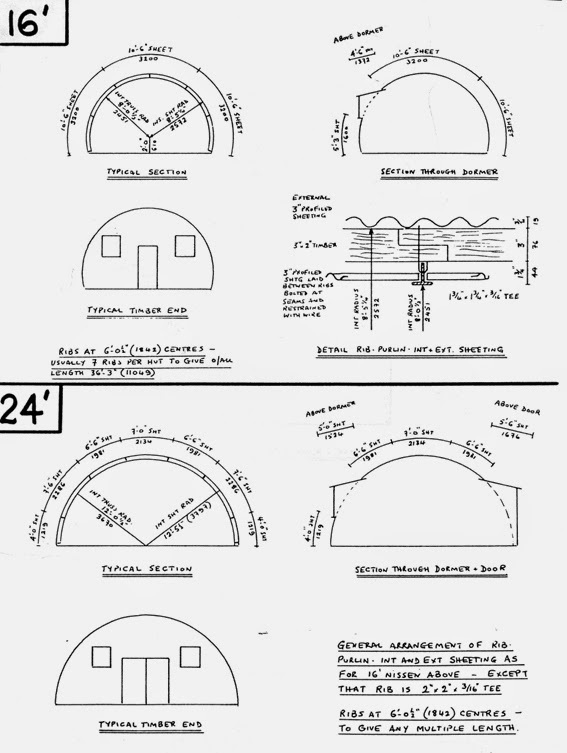 I think, the standard Nissen hut was 24 feet wide, maybe 8 feet high. 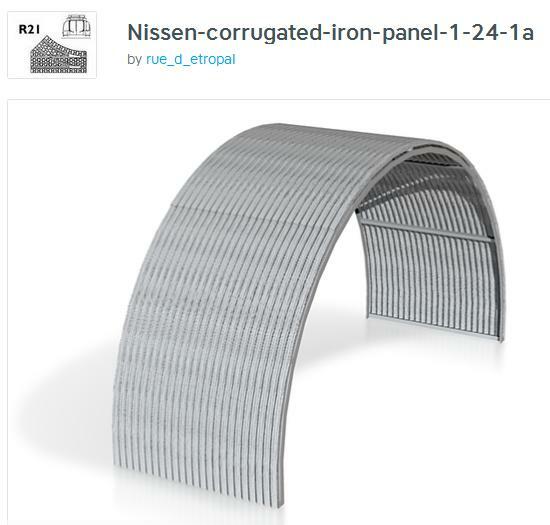 For Gn15 / 1 : 24 scale I ´d probably use suitable coffee or soup tins to get the corrugated iron material. Nissen huts are one subject I have done quite a bit of research on. I bought the book about Quonset huts a few years ago, but it does not have enough info on dimensions. I had searched online but found nothing, so it was encouraging to find some good drawings online this time. The classic Nissen hut is 16ft wide, but was also done in 24ft and 30ft widths. Interestingly the curved panels for the 16ft one are actually bigger than the ones for 24ft. A school had some Nissen huts and had published info on sizes. Unfortunately they did not have any of the biggest ones, so no details. I wouls assume they were more similar to the 24ft ones. The panels on the 16ft ones are 10ft 6in long, and each section of building(framework) is 6ft. Based on normal corrugated iron being in pieces about 30in plus overlay, this would result in odd figure for section, so maybe the panels ere either wider or narrower. My initial design in 3 sections is full 6ft wide, and overall in 1.12th scale, far too big to print(it seemed to stick on upload), so I would panels separately. Need to do some tests on framework. In 1/32 scale first test on complete section including framework uploaded OK, so hopefully OK for 1/24 as well. If not, then it will be the curved pieces which will be printed(they are the difficult piece to make). Would like to know actual widths so can produce sections to make un-built huts etc. Most of the kits I have seen only reproduce outside, not inside, unless you opt for one of the fancy etched metal kits, but not sure if they are available in bigger scales. One thing that had not dawned on me was that this year the Nissen hut is 100 years old, although it is partly based on older designs. The patents date from 1916. That website is new to me. odd I did not find it. Some interesting photos, and one showing construction of an even bigger hut(40ft wide). Looking at one photo and I estimate each piece is 2ft wide plus overlap. Will have to count waves to check(8 times 3in is 24in so that must be it- so with overlap 27 or 30in). one of the photos on that website is interesting. The text talks about conversions to 2 level houses, but I had not seen any photos till now. Colour photo suggests still exists, or certainly post ww2. That would make an interesting model in smaller scale. found that they still exist , were built around 1925, just down road from Fleet Air Arm museum in Somerset. Not sure how common they were. Managed to get 1/24th scale version of middle section uploaded. I have added internal framing. The end frames are in effect half, so when joined to next make a whole. It is about 8in across, 3long and about 4in tall, so is big! Not sure about ends yet. To be fair, they are easy to make, but no harm in offering model to print. window sections for sides as well. Not sure if a Gn15 would fit, Might have to do the bigger 24ft version. Looking good. The real things seemed to have some kind of isolation inside. I have one of the JG models. In fact I got one of the half versions, still not cheap, And not suitable for open sheds etc. Nice, though. Not absolutely sure about scale as some of their range is slightly bigger at 1/30. I have seen something sold in USA, but think it might be a repackaged version of the JG one. With 3D printing I can do any scale, but smallest will be 1/55 and 1/64. as thee are models for smaller scales. One of the problems with the Nissen hut was insulation, or lack of it. All they used was a thin inner wall held between the framework pieces. The Quonset evolved out of it, and the Americans tried all sorts of different modifications for different weather conditions. I have completed a version for 1/55 scale, but due to complexity(all those curves) it is a big file, so had to be done in two halves. For bigger scales, sections will have to be the norm, but there probably is not enough room for a full sized hut, even the basic 16ft one. the drawing I have shows this one being 36ft long(6 sections). For an enclosed one(say just an end), then no detail inside which helps with file size. On ckecking out some known uses of these huts being used for engine sheds, I found a nice example on an O16.5 layout, I think part inspired by Sand Hutton, but this was single track . The 16ft Nissen hut is wide enough, but by raising it of a few rows of brick is tall enough to fit loco, height wise. I have done some changes to the corrugated profile, in the hope it might reduce file size, but it did not. The shape is better I think, and I have made it easier to line up one section to the next. The original design meant there was a back and front. As file size prevents a single structure, it makes sense to have sections fitting together easier. That has just reminded me of an article I need to check out. Though just a larger building the same arch shape and not one of these huts, in Peoria, Illinois, at least through the June 16, 1960 photo date, it appears the Minneapolis & Saint Louis Ry had an arched building for the engine house at their Bartlett Yard. Of course I could be wrong but the building is deep in the interior of the yard with yard tracks on both sides and there is an early hood unit partway in the one door. But it does lend credence to the concept. Quonset huts came in many sizes and were used for all sorts of thing in USA. I have the book on them, but have not seen one used as an engine shed. Some had extra side walls so height could be increased, but without these, to get 15ft which I think would just be enough, the width would have to be 30ft. Most have sizes listed for them. They also show a modern version with larger corrugations that is free standing with no framing. there is a lot of info out there about the Quonset version. As mentioned I have the book on the subject. The Quonset hut is very much an iconic part of post war USA history, used in the way the prefab house was used in Britain. What surprised me was the relative lack of info on the origial Nissen hut. I have now found enough info including dimensions. A certain amount of estimation/guesswork as well based of wave of corrugations assumed to be 3in. There is an HO model kit of the Quonset hut, and a Roco Minitrains model which although designed to be used with their HO vehicles, actually scales out at nearer 1/76 scale and is more like a Nissen hut. The Italeri version(1/72) is unusually a model of one version of the Quonset which has horozontal corrugations, a type tried to see if production could be simplified, but less successful in the field.